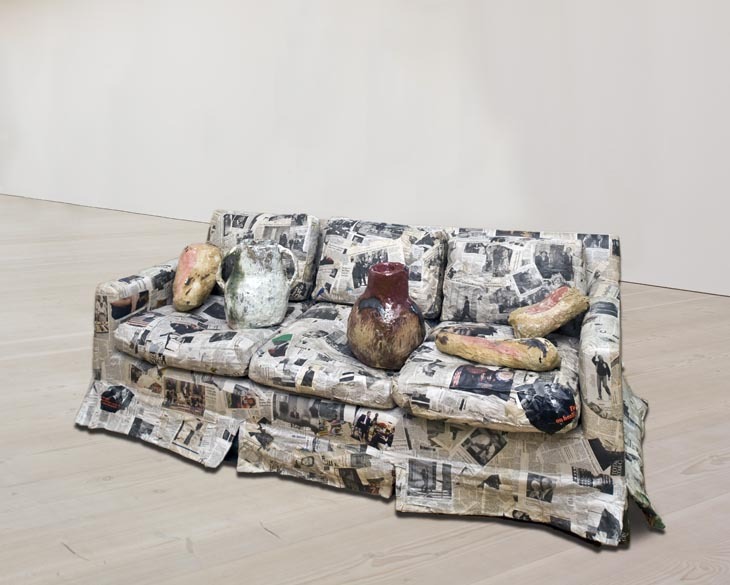 The title of Couch for a Long Time, Jessica Jackson Hutchins’ mixed media sculpture, implies a kind of indolence, a suggestion of idling, and the colour-streaked ceramic pots and sculptures seem to sit on the receiving cushions of their newspaper- clad couch like lazy characters in front of an absent TV. The physicality of the ceramic pieces’ forms – their bone- or flesh-coloured glazed surfaces, their bottom- heavy fatness – invokes the human body; even the couch itself, its cushions bulging like tongues in reaction to its occupants, has a bodily fatness, a subservience to gravity. By contrast, the couch’s surface, covered with newspapers, implies a different temporal idea: the speed of a news story, its sudden irrelevance. That the newspaper clippings repeatedly refer to the then-incumbent President Obama gives these parallel speeds added poignancy. Differing rates of change – the ceramic pieces, protected by a sheen of glaze, will remain intact for as long as they’re carefully held; both the material and the content of the newspapers become dated almost immediately after they’re printed – gives the title additional meaning. Obama became a vessel for certain ideas of optimistic change after the Bush presidency; debatably, those ideas have dated, even lost their lustre. The couch, too, accrues meaning by association: once in Hutchins’ childhood home, its newspaper covering is a kind of protection, as though the room around it were being painted. That, and the preservation implied by the vessels, gives Hutchins’ piece the gravitas of a domestic monument, to be remembered – with a kind of sad hope – for “a long time”.